This truly scrumptious bundle from our friends at Marshfield Ice Cream is full of specially chosen goodies - dollop fun flavours on your spelt waffles, pancakes and other spelt bakes! Making the very best dairy ice cream is a way of life at Marshfield Farm, in fact, we’ve been creating real dairy ice cream on our West Country family farm for nearly 30 years! Our favourite saying down at the farm is ‘cow to cone in 24 hours’ and that’s because the organic milk used in our ice cream was milked from our cows just 24 hours prior to production! Across the years we’ve developed our mouth-watering range into 30 variations of lavish ice creams and refreshing sorbets. Bursting with natural flavours and full of textures, we want our customers to taste the love we devote to each product. We’re proud to say many of our products are multi award-winning flavours; this year alone we’ve claimed four Taste of the West Awards! We want to share our love of our ice cream product and give you the chance to win 6 of our 500ml litre tubs ­– and best of all, you get to pick the flavour! 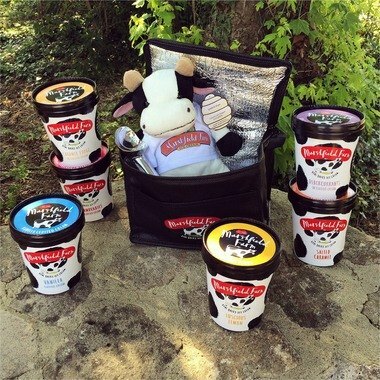 Not only this, the competition winner will receive a professional ice cream scoop, cuddly Marshfield Farm Cow and a Marshfield Farm Ice cool bag! WE RECOMMEND: Summer Raspberry Spelt Cake with a dollop of Marshfield Clotted Cream - Ice Cream! Get the recipe here! Enter your details in the form below to be in with a chance of winning this lovely prize and we’ll choose one lucky winner on Monday 31st July 2017. Terms and conditions: Entries close on Monday 31st July at 12pm when one winner will be selected at random. The competition is open to UK residents over the age of 16 excluding employees and affiliates of Sharpham Park and Marshfield Ice Cream. One winner will win the Marshfield hamper pictured. The prize is non-transferable and has no cash alternative. The prize will be posted to the winner by Marshfield Ice Cream, using postal address supplied by the winner. The name of the winner may be shared on Sharpham Park and Marshfield Ice Cream social media pages and other publicity. Sharpham Park reserves the right to change or withdraw the competition at any time and for any reason. By entering the competition, you are agreeing to these terms and conditions. We may share your information with select, trusted third parties, unless you inform us otherwise by email to marketing@sharphampark.com. For more information, please email marketing@sharphampark.com.